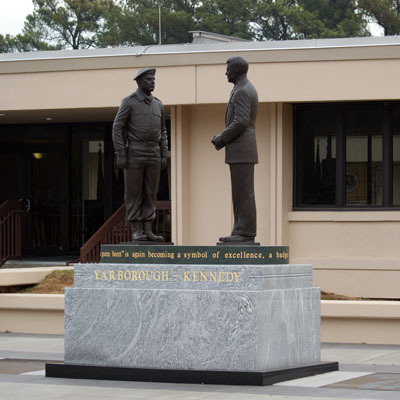 Description: This statue depicts in bronze the figures of President John F. Kennedy and Brigadier General William P. Yarborough as they consult during Kennedy's visit to Fort Bragg on October 12, 1961. Yarborough stands at attention with his arms at his side and wearing the beret, symbol of the Special Forces, as the president speaks in approval of its official use. The statues stand somewhat larger than life, at over seven feet tall. They stand atop a polished granite oval which is mounted on a rectangular granite plinth. The face of the oval base is inscribed in gold inlay to commemorate the green beret as the symbol of the excellence and honor of the soldiers who wear it. The plinth below is inscribed in gold inlay with the names of the figures on the front face and the date on the rear. Base: "The green beret" is again becoming a symbol of excellence, a badge of courage, a mark of distinction in the fight for freedom. Unveiling & Dedication: The monument was dedicated in conjunction with a Special Forces Qualification Course graduation during the Special Forces Regimental Day ceremony on April 5, 2012. A bagpiper lead a procession of course graduates, and the statue's sponsor, H. Ross Perot, was the guest speaker. Graduates were dressed in their camouflage patrol gear. Perot gave his speech from the podium used by President Kennedy during his visit to Fort Bragg and held in his hand the green beret worn by Col. Arthur "Bull" Simons. In 1999 Perot donated a statue of Simons located nearby at Fort Bragg. Subject notes: In the early 1960's, Yarborough had attempted to convince the U.S. Army to adopt the green beret as the official headgear of the Special Forces. The statue represents an image taken during the meeting between Yarborough and President Kennedy at Fort Bragg in 1961 in which Kennedy approved the use of the green beret as the official headgear of the Special Forces. The Special Forces have become more commonly known as the "Green Berets" because of their official headgear. Location: The monument sits at the entrance to the JFK Special Warfare Museum on Ardennes Road. It faces west. Landscape: The monument is located in a small paved plaza in front of the building.